Dodgers game may have a wide TV audience again with Charter deal. When cable companies merge, people at home wonder "how's it going to affect me?" and the answers aren't always obvious. 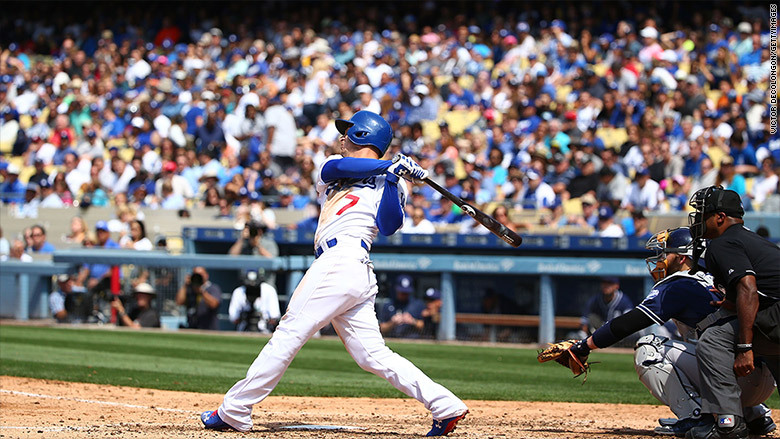 But in the Charter-Time Warner Cable merger, there's one benefit that will be apparent almost immediately: Charter customers in southern California will suddenly be able to watch the Los Angeles Dodgers again. Most Dodgers games are currently only available on SportsNet LA, a local sports channel set up at great cost by Time Warner Cable. Now that Charter and Time Warner Cable want to be part of the same company, Charter CEO Tom Rutledge is telling Californians that the Dodgers are coming to Charter's channel lineup. "We have promised to bring it to our California subscribers in the next couple of weeks," a Charter spokesman said Wednesday. Charter's move looks like a goodwill gesture as it seeks widespread support for its merger plan. Los Angeles is one of its most important markets. Charter already has customers in California locales like Long Beach, Malibu, Glendale, and Burbank. And it'll pick up many more through the addition of Time Warner Cable, a dominant player in the region. In an interview with The Los Angeles Times, Rutledge indicated that Charter-Time Warner Cable would apply more pressure on the region's other distributors to carry the Dodgers channel, as well. "We want the Dodgers on every outlet and we are committed to making that happen," Rutledge told the newspaper. Orange County Register columnist Michael Lev reacted to the news this way: "Could this be the game, er, channel changer we've all been waiting for?" Well, maybe. As Lev noted, DirecTV, one of Charter and Time Warner Cable's rivals, issued a statement on Tuesday saying that it's not budging on its opposition to the high fee for SportsNet LA. "We continue to hope [Time Warner Cable] and the Dodgers front office will compromise with the rest of Southern California's providers," DirecTV said, "so all Dodgers fans can watch their games without burdening everyone else with significantly higher fees."